Had it up to here with purchasing endless boxes of Popsicles for the kids? Finding it hard to trust yourself with that pint of Rocky Road lurking in the freezer? If so, we’ve got some healthy alternative to traditional popsicles and ice cream to help sate your sweet tooth without the overly tempting array of goodies. Remember that these aren’t freebies! All these options (save for the slush recipe) still contain Calories, all of which matter in the context of weight management. These are still treats, so be sure to utilize portion control. The only zero Calorie option on this list, slush is also the easiest to make. Purchase flavored, zero Calorie beverages in plastic bottles (for example, Sparkling Ice) and place in freezer. Do NOT use canned beverages, which will explode. Freeze until partially frozen for a refreshing, slushy-like treat with no Calories or sugar. Blend various types of fruit with a zero Calorie beverage (water works fine, or a beverage like Sparkling Ice) and place in pitchers. Using a popsicle mold, partially fill molds with fruit puree. Freeze until solid, then remove from freezer and fill mold to top with a different flavored filling for fun, layered treats with no added sugar. 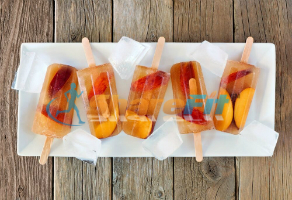 The easiest and healthiest “popsicles” you will ever make! Slice watermelon into triangle slices, rind intact. Using a wood or metal skewer, insert into rind. Melt a small amount of bakers chocolate and drizzle atop slices. Refrigerate until chocolate hardens and ready to serve. Toss together mixed berries (strawberries, blueberries, raspberries, etc) with minced basil and mint for an adult take on fruit salad. Cute pineapple into triangular slices and grill. Top with a small drizzle of melted chocolate to serve. Too hot for grilling? Prepare by slicing into cubes, threading 3-4 cubes onto wooden or metal skewers. Drizzle with baker’s chocolate and allow to harden in refrigerator before serving.